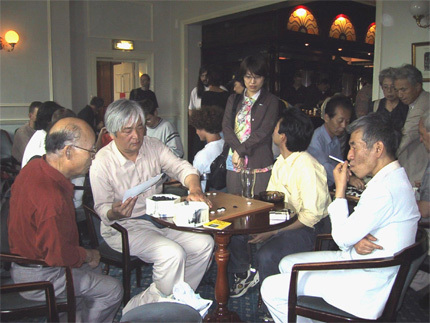 Saijo Masataka (西條 雅孝 Saijō Masataka, born 1941) is a Nihon Ki-in professional Go player who reached 8-dan in 1981. Saijo is a regular visitor at the European Go Congress. He was appointed Honorary Go Teacher of the European Go Federation. Both Catalin Taranu and Cristian Pop spent their insei years with Saijo as sensei. Saijo often participated in the French summer Go camp. Saijo Masakata is now retired. Anonymous: small note: I think Saijo is a 9d professional.